The Dive to the Heart is a location which appears in Kingdom Hearts, Kingdom Hearts II, Kingdom Hearts coded, Kingdom Hearts Birth by Sleep, Kingdom Hearts 3D: Dream Drop Distance, and Kingdom Hearts III. It is framed as a world within a dream, and its nature as the dreamer's heart is reinforced by the background music, the gameplay tutorial, and the strange way of speaking used by those within it (a manner also used by the remembered characters of Kingdom Hearts Chain of Memories). However, the events which occur within it have a real effect on the waking world, and in two instances they are actually observed by outside forces. In terms of gameplay, the purpose of the Dive to the Heart is to serve as a tutorial level, where the player will learn the controls of the game, choose how their character will grow, and fight their first boss. The player is guided through the Dive to the Heart by an inaudible, unseen "voice", whose identity is eventually revealed to be that of King Mickey for Sora's dive, and Sora for Ventus's. To reinforce the dreamlike setting of the Dive to the Heart, Sora, Roxas, and Ventus each reach it by falling into an ocean. However, instead of drowning, they find that they can breathe, and land upon an ocean floor which erupts into doves, revealing the Dive to the Heart. In Roxas's case, this first Dive to the Heart is merely a memory of Sora's, and he enters his true dive three days later. 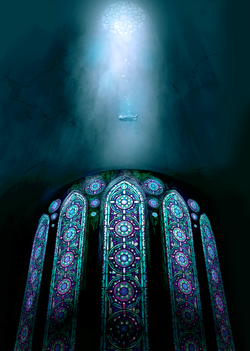 The Dive to the Heart is composed of several enormous, illuminated stained-glass pillars known as "Stations", rising from unseen depths. Each Station has a unique shade, depicts a specific set of characters, and has its own specific part in the tutorial. In the first game, there is an additional area of the Dive to the Heart based on Destiny Islands. The background music, "Dive Into the Heart (Destati)", initially begins quietly and hard to hear, but grows in intensity as Sora or Roxas approach the final pillar, where they fight a manifestation of the darkness within them. At the end of their battle with the creature, the Dive to the Heart is consumed by the darkness emanating from it, dragging Sora or Roxas with it, but they either wake up or are rescued. Early screenshot of Sora's Dive to the Heart in Kingdom Hearts Chain of Memories. Sora's Dive to the Heart was originally set to return as part of Kingdom Hearts Chain of Memories, but was removed from the final game. When Roxas is in his Dive to the Heart, the command menu is styled after the original Kingdom Hearts. At the beginning of the game, the player finds themselves on a station where one of the Unions – Unicornis, Leopardus, Anguis, Ursus or Vulpeus – has to be selected. After the decision is made, the station is engulfed into darkness that is quickly repelled by a light which turns out to be the Starlight Keyblade. The menu backdrops for Kingdom Hearts Union χ feature a unique station which only depicts the emblem of the Book of Prophecies. Various stations appear in the opening. The trio's Wayfinders turn into Aurora's, Cinderella's and Snow White's stations before turning into the links of the Star Seeker's Keychain. Later, a falling Aqua sees Ventus's station before Way to the Dawn and the Kingdom Key land on its head and shatter it, causing Ventus to fall. After the tutorial chapter, the player enters another Dive to the Heart, where they can choose whether to continue the story with Terra, Ventus, or Aqua. This Station displays the trio's Wayfinders, but is purely a gameplay mechanic. Ventus's blank and collapsing Station. Chronologically, Ventus's Dive to the Heart, called "Ventus's Mind", is the first to be seen, and appears in an incomplete state due to his broken heart. It is here that Ventus comes in contact with the newborn Sora's heart, and his Station is restored. Ventus does not return to the Dive to the Heart until he involuntarily fuses with Vanitas, his pillar changing appearance with the sudden presence of darkness in his heart, and is renamed "Soul World" (精神世界, Seishin Sekai?). Ventus's Station is quite similar to Roxas's, but features a sleeping Ventus without his Wayward Wind at the Keyblade Graveyard, rather than Sora with his Kingdom Key at Destiny Islands. The inner circle of emblems, which usually contains images of the sleeper's loved ones, only contains a stylized fleur-de-lis, which also appears on the edges of the pillar. When Ventus is fused with Vanitas, Ventus's Station is modified—Vanitas himself now appears opposite Ventus, and both have their Keyblades. Half of the outer ring of symbols is replaced with the Unversed emblem representing darkness, while the other half is replaced with the Terra's Mark emblem representing light. The two symbols meet in the middle representing the twilight. The field of the Keyblade Graveyard is now filled with the abandoned Keyblades. The inner circle of emblems is replaced with silhouettes of Keychains for the χ-blade, the Wayward Wind, and the Void Gear. After Ven defeats Vanitas, his station changes to a form similar to its original appearance, with some modifications. Ventus is now holding the Wayward Wind and wearing both his Keyblade Armor pauldron and his silver Terra's Mark charm, while the outer circle of emblems is filled with the Terra's Mark emblem and the inner circle of emblems is filled with his friends' Wayfinders, possibly signifying that he has regained control of his completed heart. After Ventus's body is placed within the Chamber of Waking, his heart connects with that of a young Sora, who appears in his own Dive to the Heart, named "Sora's Mind". 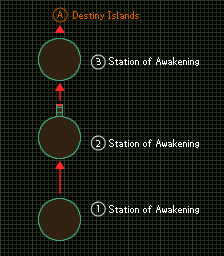 His Station displays the landscape of Destiny Islands on the bottom, with Paopu Fruits and different elements found on or around the island encircled separately on the top. In Sora's dream, he falls from the sky into the sea below with his eyes closed and slowly descends onto the ground with abyss surrounding him. As he steps into the ground, the darkness below his feet starts to transform into birds and fly away, showing a radiant light that slowly forms into a circle. Each of the Stations in his later Dive to the Heart illustrates one or more of the Princesses of Heart, as well as the characters related to them. Snow White, Cinderella, Aurora, and Belle are asleep, perhaps signifying their comatose state in Hollow Bastion. The first pillar, shaded green, depicts Snow White, the Seven Dwarfs, the forest animals, and The Queen in her hag form. While Snow White is asleep, all the other characters are depicted as awake. The second pillar, shaded violet, depicts a sleeping Cinderella. The third pillar, shaded pink, depicts three princess silhouettes, representing the three free Princesses of Heart, Alice, Jasmine, and Kairi. The fourth pillar, shaded red, depicts a sleeping Aurora and silhouettes of Flora, Fauna, and Merryweather, and the silhouette Maleficent makes when vanishing into green fire. The final pillar, shaded yellow, depicts Belle, Beast, and his servants Lumière, Cogsworth, Mrs. Potts and Chip. While Belle and the servants are asleep, the Beast is depicted as awake, signifying his freedom. All five pillars are known as Awakening (めざめの園, Mezame no Sono?, lit. "Station of Awakening"). On the first pillar, Sora is asked to walk, then is shown three weapons, the Dream Sword, the Dream Shield, and the Dream Rod. He is directed to choose one and discard another, and his choice determines his specialty, initial stats, and ability growth throughout the game. After choosing, the Station shatters and Sora falls to the second pillar, where he first encounters Shadows, and is taught about battling and its rewards. The Station then sinks into darkness, and Sora awakens on the third pillar, where he is taught how to examine and interact with objects. By opening a treasure chest, moving a crate, and destroying a barrel, he materializes a door that leads to a dream version of Destiny Islands, where Sora meets facsimiles of his friends, Tidus, Wakka, and Selphie, which ask him enigmatic questions that determine how he gains experience throughout the game. 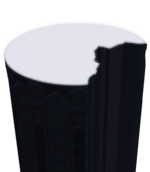 On the fourth pillar, Sora is again attacked by Shadows, but after defeating them the first Save Point is revealed, as well as floating steps to the final pillar. However, the steps vanish as he climbs them, trapping him on the fifth pillar. As he approaches a strange light, his shadow grows and becomes his Darkside; though he fights it, its darkness swallows him, and he reawakens on the Destiny Islands. The door reappears on Destiny Islands when the island is attacked by the Heartless, this time leading to the Secret Place containing the world's Keyhole. It reappears a final time at the Final Rest within End of the World, leading to the remains of the Destiny Islands and the final confrontation with Ansem, Seeker of Darkness. Roxas in his Dive to the Heart in the opening of Kingdom Hearts II. Roxas's Dive to the Heart appears in his dreams as he processes Sora's memories. As Roxas steps onto a Station, it is formed from a swirling flock of birds. On the third day of his story, Roxas encounters a Dusk in the Sandlot and is sucked into his Dive to the Heart. Like Sora's, Roxas's Dive to the Heart consists of five stained glass pillars, but each of these depict the same image of Sora, Riku, Kairi, Donald Duck, and Goofy at the Destiny Islands, and the pillars are divided between only three Stations. Sora's eyes are closed, showing that he is asleep, while Kairi and Riku's are open, showing that they are awake; strangely, Donald and Goofy's eyes are still open, even though they are asleep as well. Roxas awakens on the Station of Serenity (やすらぎの園, Yasuragi no Sono? ), where he chooses between the Dream Sword, Dream Shield, and Dream Rod. While this choice determines the order in which he learns abilities as before, the weapon he chooses is immediately transformed into the Kingdom Key (This is different than in the original Kingdom Hearts Dive to the Heart as he does not have to give anything up in exchange for his weapon). He goes through a door to the Station of Calling (いざないの園, Izanai no Sono? ), consisting of three pillars shaded blue, green, and red and connected by floating stairs. Here, he encounters Dusks and learns about Reaction Commands and treasures. Going through another door, he enters the Station of Awakening (めざめの園, Mezame no Sono? ), and finds an apparition of himself in his black coat which soon becomes the Twilight Thorn. Similar to Sora's Dive to the Heart, after defeating the Twilight Thorn, Roxas and his Dive to the Heart are consumed by darkness, but unlike Sora, Roxas is rescued by Naminé at the last minute. Much later, as Sora approaches Memory's Skyscraper, Roxas reawakens inside him and takes him to the Station of Awakening, where they battle and come to peace with each other. This arena is replicated in the Garden of Assemblage for the fight against Roxas's Replica Data. 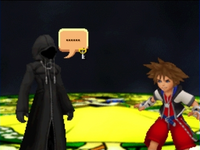 Sora encounters a hooded figure in Kingdom Hearts Re:coded. Data-Sora manifests in a digital version of the Dive to the Heart that is virtually the same as the real Sora's dive. He spots Data-Roxas, but does not recognize him before he disappears, and later mistakes him for Data-Riku. Sora is given the choice to choose between the Dream Sword, Dream Shield, or Dream Rod and which one he is willing to forfeit. However, due to Chip and Dale's reprogramming, the Dream weapons immediately change into the Keyblade, as in Roxas's dive. After fighting off an ambush by a swarm of Shadows, Data-Sora enters the same door that Sora did in his own dive, but this door leads directly to the "real" Destiny Islands, rather than a dream version. After bringing the comatose Sora back to the Mysterious Tower, Riku dives into "Sora's Soul World" (ソラの精神世界, Sora no Seishin Sekai? ), drifting past memories and various floating Soras. Upon landing, he finds the stained glass window floor consumed by inky darkness, from which emerges the Armored Ventus Nightmare—Sora trapped inside Ventus's Nightmare-possessed Keyblade Armor. When Riku defeats the Nightmare, the armor shatters, releasing Sora. The darkness envelopes Sora as it dissipates. Riku picks up Sora's dropped Keyblade and uses it to unlock the Sleeping Keyhole of Sora's heart. In a flash of light, he suddenly finds himself on a facsimile of the dock at Destiny Islands, at sunset. Walking around on the beach, Riku encounters Roxas, Ventus and Xion, each asking him a different question: "What are you so afraid of?," "What do you value more than anything else?," and "What do you wish?" After Riku answers each of their questions, there is another bright flash of light, and Riku finds himself back on the beach, where he sees a message in a bottle drifting ashore. When Riku picks it up, a digitized version of Ansem the Wise appears, placed inside Sora's heart along with his research data. Ansem the Wise reflects upon the strength of Sora's heart, and theorizes that Sora may have the power to recreate people long thought lost forever. All Sora needs to do is be himself and follow wherever it is that his heart takes him. The rest is in the data in that bottle Riku just found. Ansem the Wise then reveals that Sora has already awoken. Defeating the Armored Ventus Nightmare freed Sora, and answering the questions of Roxas, Ventus, and Xion woke him up. Thanking Ansem the Wise, Riku summons Sora's Keyblade and prepares to leave, but Ansem the Wise stops him, asking for his name. Chuckling, Riku recalls the last time the man had asked him that. After answering his question, Riku departs for the outside world. Sora's Dive to the Heart displays his memories. Sora falls into the Dive to the Heart in his attire and body from when he first left Destiny Islands. A mirror appears and Sora sees himself as he is in the current day. Sora walks through the looking glass and becomes his present self. The mirror disappears and a series of screens begin to float around the platform depicting Sora's memories. Three screens in particular float in front of Sora: one of his battle with the possessed Riku, another of the King's appearance at the Door to Darkness, and one more of Sora's first meeting with Donald and Goofy. A voice asks Sora which he desires, with the screens respectively representing vitality, wisdom, and balance. After Sora chooses one, three more screens appear depicting Sora's battle with Roxas, his promise to Naminé, and his reunion with the Dream Eaters. Each represents a power, that of the guardian, the warrior, and the mystic. After making his choice, Sora sees all the screens vanish. Sora looks down and notices that the platform has been covered in water, which seems to be coming from a light beyond the Dive to the Heart. Sora runs to the light as a tidal wave washes him away, taking him to The Final World. Sora enters the Dive to the Heart to wake up Ventus and save Aqua when she is defeated by Vanitas. With the power of waking, Sora is able to transform the image on the pillar from his own into Ventus's, signaling that Ventus's heart has been reunited with his body and he has awakened from his comatose state. During the events at the Keyblade Graveyard, after returning from the Final World, Sora enters a different dive using the power of waking. Stations covered in darkness serve as portals leading to worlds where the Lich is holding the hearts of Sora's friends captive. Potion Awakening Open the chest to make the box appear. After pushing the box, destroy it with your weapon and the potion appears. ↑ In Kingdom Hearts II, the Organization observes and comments upon Sora's battle with Roxas on the Station of Awakening. In Kingdom Hearts coded, Data-Roxas appears before Data-Sora on the Station of Awakening. ↑ In the Kingdom Hearts HD 2.5 ReMIX re-release of Kingdom Hearts Birth by Sleep Final Mix the image on the station is changed to that of the final Soul World station.